There are thousands of different types of bacteria in the mouth. Some of them are friendly, others are not. 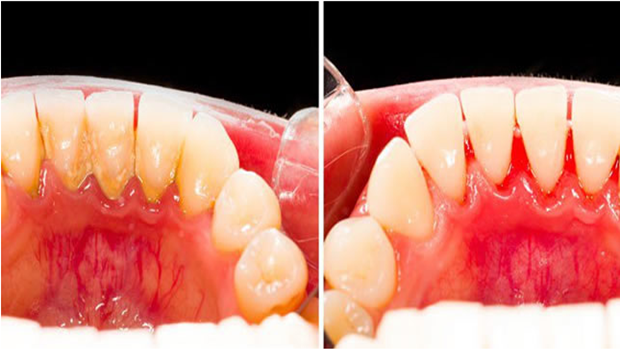 The bacteria in the mouth create a “biofilm” on the teeth – a thin layer that they use to adhere to the surface. This is what we know as “plaque”. Having some plaque on your teeth is normal, but if it gets out of hand it can cause all sorts of problems, including bad breath, yellow teeth, gum inflammation, gingivitis and cavities. Oil pulling has been used for thousands of years as an Indian folk remedy, and apparently there are quite a few studies which support this process. It involves swishing oil around the mouth for 15-20 minutes, and its main health benefit is that it reduces the amount of harmful bacteria in the mouth. Traditionally, the Indians used other oils such as sesame oil or sunflower oil. Oil pulling should work with pretty much any oil you choose, but I prefer coconut oil because it has many health benefits. The Lauric Acid (one of the fatty acids in coconut oil) is also proven to be antimicrobial; it can kill bacteria, viruses and fungi (1, 2). The taste of coconut oil is also fairly pleasant compared to other oils. Streptococcus Mutans is one of the main bacteria in the mouth and a key player in plaque buildup and tooth decay. In a study from 2008 with 20 boys, oil pulling (using sesame oil) caused a reduction in the number of Streptococcus Mutans in the plaque in as little as 2 weeks (3). It was not as effective as a Chlorhexidine mouthwash, but much cheaper and MUCH less nasty. Gingivitis is caused by inflammation of the gums and happens when the immune system starts attacking the bacteria in the plaque. Another study compared oil pulling and chlorhexidine in adolescents with plaque-induced gingivitis. Both oil pulling and chlorhexidine mouthwash were effective against gingivitis (4). Bad breath, otherwise known as halitosis, is in many cases (not all) caused by the smell of chemicals and gases produced by bacteria in the mouth. It makes sense that if you get rid of some of these bacteria, you reduce bad breath. Swish the oil around your mouth for about 15-20 minutes. When you swish the oil around your mouth, the bacteria “get stuck” in it and dissolve in the liquid oil. You basically remove a large amount of the bacteria and plaque in your mouth each time you do this. If you use coconut oil, then you may have to chew on it for a minute or so to let it melt, because coconut oil may be solid at room temperature. It is best to do this on an empty stomach, before you brush your teeth. There is no need to use a lot of force here, if oil pulling causes pain in your facial muscles then just relax a bit. Try using less oil next time and don't swish it around too forcefully. I've been doing this for about 10 days now, and I've definitely noticed that my breath is fresher and my teeth look a lot cleaner, both whiter and more shiny. I've never had any dental problems, but I can see how this could have benefits for people that have them. Given that inflammation can cause all sorts of health problems, it does make sense that reducing inflammation in the gums, could lead to benefits for overall health as well. Perhaps that's the reason why many people report improvements in health issues, that really have nothing to do with the mouth. You may be really surprised at how effective this is! I plan to continue doing this for a long time.